Until the last year or so, I’d never tried quinoa. Then, on a whim, I grabbed a box at Trader Joe’s while picking up my regular rice. Quinoa is a wonder grain – gluten free and a good source of protein, iron and fiber. It’s a great substitution for rice – and quick cooking to boot! This recipe was born of me wanting to make something vegetarian but hearty. Rich portabella mushrooms make you forget there is no meat in this dish. And (in my opinion) mushrooms and spinach are a match made in vegetable heaven. Add onion, garlic, thyme and nutmeg and this dish is a surprisingly savory and satisfying meal (say that five times fast). Serve with a fresh green salad for a complete, elegant meal. In a large bowl, combine flour, baking powder and salt; cut in butter until crumbly. Stir in enough water to form a soft dough. On a floured surface, roll dough into a 12-in. x 8-in. rectangle. Press into a 13-in. x 9-in. baking dish coated with cooking spray. Bake at 400° for 13-15 minutes or until very lightly browned. While the crust is baking, heat olive oil in a nonstick skillet. Saute onions and garlic till tender, then add mushrooms. Continue cooking till mushrooms are tender. Add the thyme and nutmeg and season generously with salt and pepper. Throw the spinach in with the mushrooms and wilt. 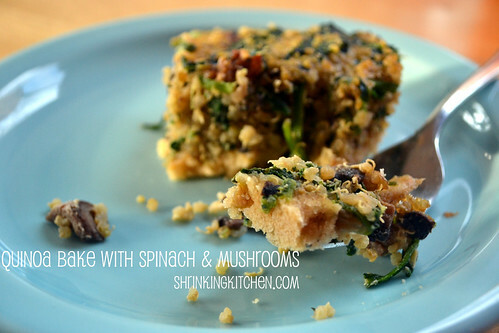 Remove the mushroom/spinach mixture from the heat and add quinoa and eggs. Mix well. Spread the mixture onto the crust. * To make this recipe gluten free, simply skip the crust and spread the quinoa/egg/vegetable mixture in a greased baking dish and bake for 20 minutes at 400F. This is delicious!! I bought a premade crust because I’m lazy, but yum!! So excited about this dish! The husband is making it tonight. Thanks for your recipes! Wow, wow! Made this but substituted collard greens. Also, I topped it with 3T of Parmesan cheese, which put calories to an even 160. All about whole numbers! Great recipe – again. Thanks much!